When it comes to choosing the food for your wedding, whether that be the caterer or the snack bar, you know that it’s something that’s going to be a talking point for your guests. We all love food, and if you’re guests are going to get dressed to watch you married your significant other, they’re going to want to celebrate with you after over some drinks and some snacks. 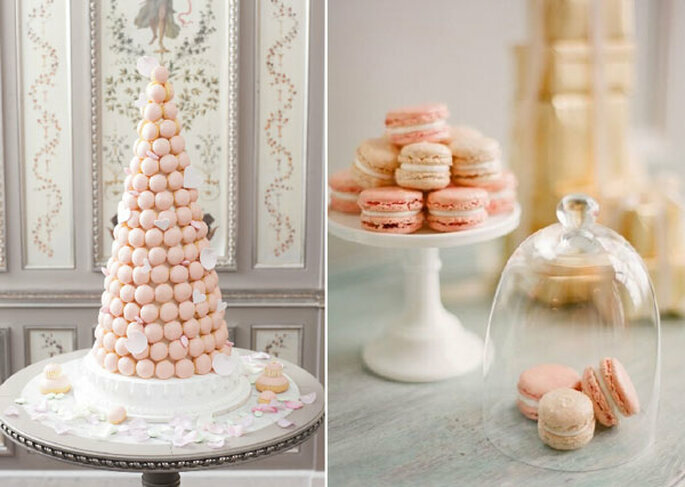 A wedding trend that has been growing in popularity is having a snack bar full of delicious macaroons! With their multi range of colours and rich, varied flavours, they create a yummy and completely unparalleled taste sensation! Difficult to resist, not only do they taste delicious, they also look so pretty. The best part, is that you have the option of playing with their range of colours in order to match your chosen wedding theme. Macaroons and their kaleidoscope of colours are beautiful and a real symbol of Parisian chic which will add a touch of glamour and luxury to any celebration. In the 2006 movie Marie-Antoinette by Sofia Coppola, the queen revels in tasty macaroons at her fabulous parties with ​​friends and at important high society ceremonies and events, showing they are a true historical symbol of wealth and decadence. 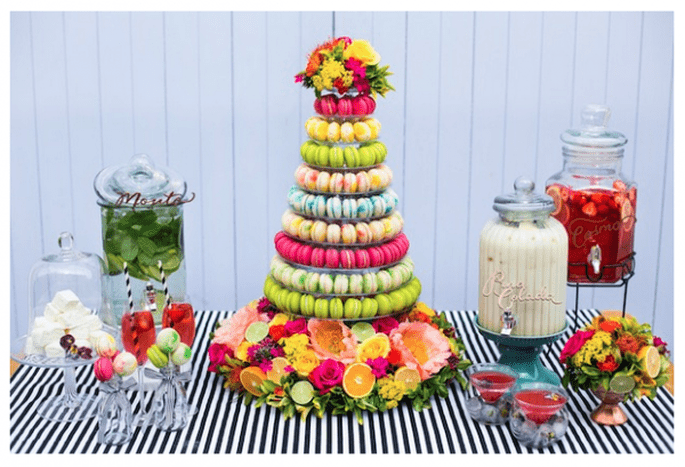 Macaroon cakes have become a real trend at weddings in recent years and allow you to really emphasise your theme and colour scheme with their magnificent tones. This choice of dessert is classic, unique, colourful and above all… delicious. We’re sure your guests will be absolutely delighted! 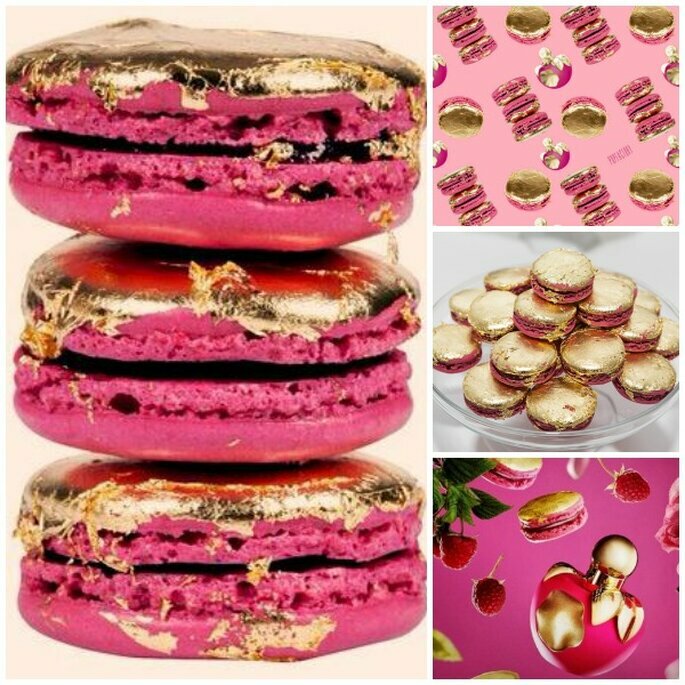 Originating in France, the two names that dominate the world of macaroons are Ladurée and Pierre Hermé. 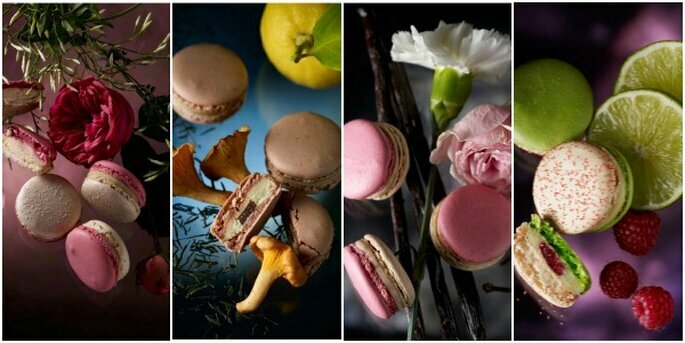 Difficult to decide which is the best and leading macaroon maker as they are equal when it comes to fame and prestige. Here is a little advice to help you differentiate according to your preferences and what exactly it is you want to achieve with your macaroons. 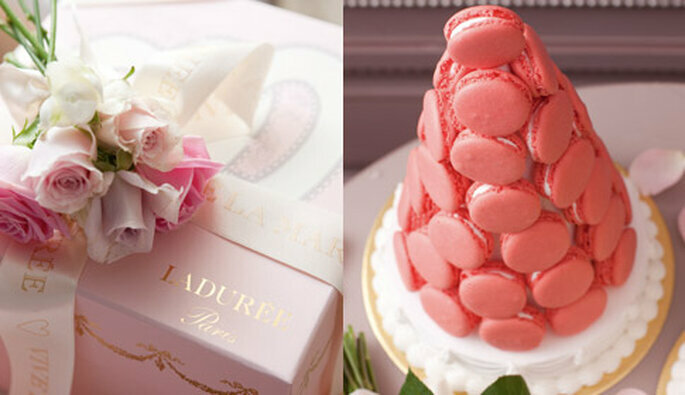 If your style is looking for something a little more traditional and classic, then I recommend Ladurée. A classical institution with magnificent creations. 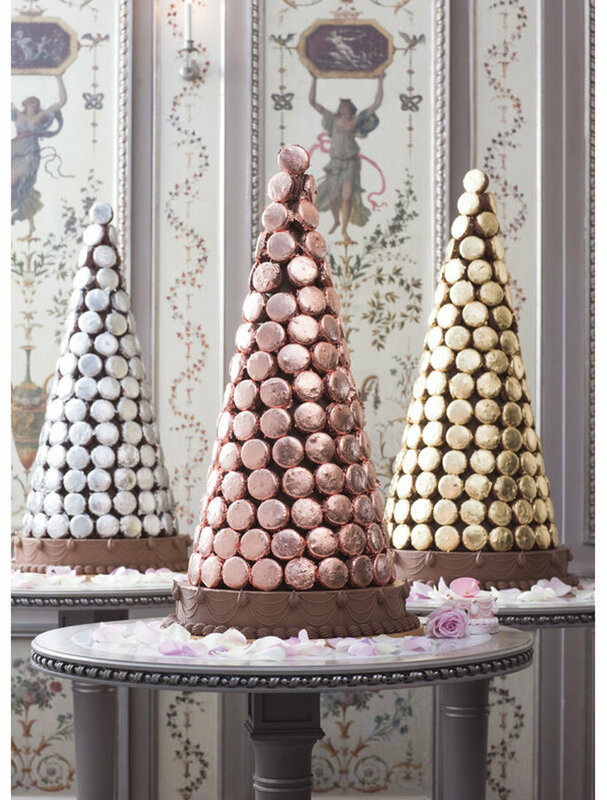 Just imagine how beautiful these would look as a pyramid of macaroons, amazing! If you’re after something a little more daring with unexpected flavours, then you’ll be totally seduced by the creations of master Pierre Hermé, named the “Picasso of Pastry” by Vogue. His 2014 collection, offers a gastronomical garden theme and is simply divine with creations such as delicate garden scented Rose and Jasmine, spicy Anis and Saffron, or salted garden green tea and Chanterelle and lemon. A flavour sensation which you need to taste and judge for yourself! 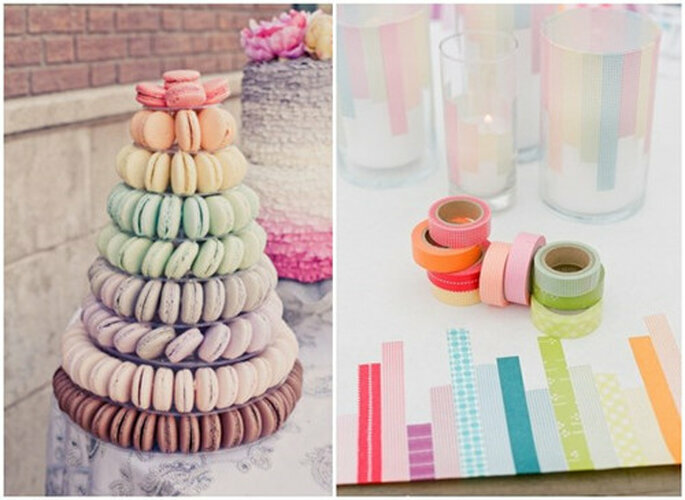 Macaroons really enable you to play around with the creativity, décor and styling of your wedding. Gold leaf macaroons for an evening reception that will add an incredible sparkling tone or pastel shades for a bright summer wedding. Not only as a cake, macaroons are also great as petit fours to serve with coffee or as magnificent favours for your guests. If you’re looking for something a little sweeter then why not include them as part of a dessert or sweet table. They will look wonderful in contrasting colours, served in glass jars or vintage cake stands and will add another dimension to all the other sweet treats being offered. With a glorious array and choice of colours, decorations, tablecloths and accessories, this sweet table will be the center of attention and a wonderful focal point for your reception. 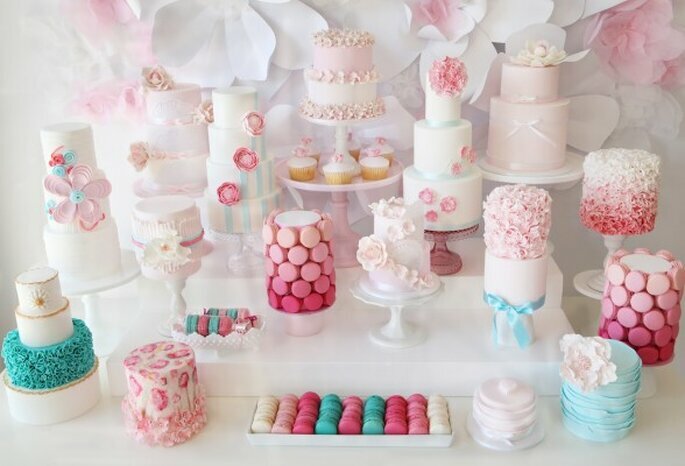 It can also create a dazzling display for you to showcase your wedding (non macaroon) cake. If you’re feeling a little creative, why not make your own. These will be much cheaper and make a wonderful addition if you’re having a DIY wedding. A word of warning, macaroons do contain nuts, so watch out for any guests with allergies. Have we tempted you with these yummy treats? 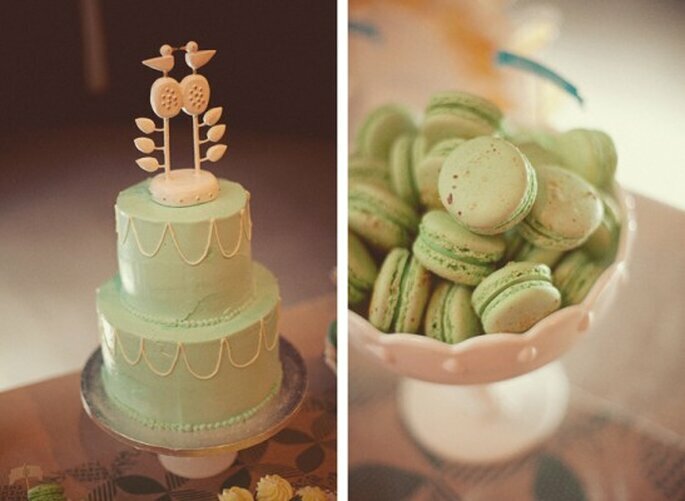 Would you consider a macaroon cake or are you sticking to tradition? Let us know!